I read billboards. Sure they’re an annoying blight on the horizon but if someone displays a message, as a compulsive reader, I’m duty bound to read it. Billboards keep it simple. It’s a giant magazine advertisement that leaps off the page and into the roadway. 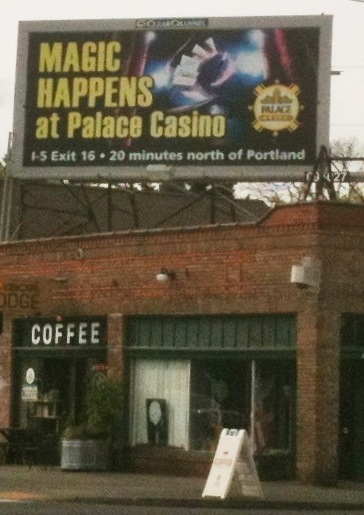 Billboards for local casinos have been calling out to me. My reading addiction overpowers my gambling compulsion so mostly I stay home. The idea of an evening out listening to a cacophony of slot machine chimes is a siren’s wail I can barely resist. I couldn’t pull the trigger on the Year of the Ram celebration or the weekly seafood buffet which is on a week night but when I saw the “Magic Happens” sign I began imagining a magic show at the casino that seemed to be the perfect entertainment concoction to inspire me to get out of the house. I’m thinking old school magic show, tuxedo clad magician, burlesque attired assistant who would get cut in half to end the show. There would have to be something else going on at the casino to keep me there longer than the half hour it would take for me to gamble away the family nest egg. I thought of it as an nice evening out for my wife and me. Then I realized I didn’t know if she liked magic shows. She confirmed that she didn’t like magic shows much but she would go if I asked her. After several attempts of getting a satisfying picture of the billboard it hit me that the sign might just be a bit of advertising mumbo jumbo implying that if you go to the casino you may hit the right button or pull down the right slot machine arm and money would magically swirl around you and fall into your pockets or a pile to be carted home in a wheelbarrow. Maybe I was too literal in my interpretation of the billboard. Could it mean no magic show? There was no evidence of any performing magicians appearing at the casino when I looked on the website which meant it was time to put my crack team of investigators on the case and pick up the phone. To be honest, my crack team is really me flying solo. I talked to an operator at the casino who told me that they don’t do magic shows. She had not seen the billboard and didn’t know what it meant. The operator was friendly and really nice about my investigation into this magic billboard conspiracy. I did ask if they would ever have magic shows at the Casino and I believe her answer was, “no, I’m sure they won’t.” The finality of that statement hit home. I asked why and she sweetly suggested I take my questions to a higher authority. I was given the extension of the promotions director. I’m not KOIN news you know, I’m not watching out for you or anyone except, maybe, myself. I’m not giving up either. I can speculate that the don’t want anyone getting stuck with swords when the magician does his cut the lady in half act and sticks the box with several blades or however that trick goes, but I’ve never been to the Palace Casino so I don’t know if they even have the proper performance space for a magic show. 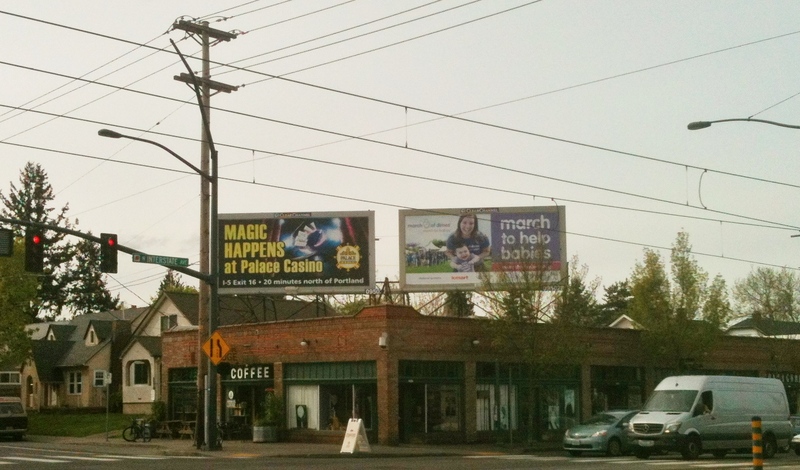 Besides if I really need to go to a magic show there’s probably ten going on any given night in Portland. They probably do basement magic shows. I will seek them out. There’s no way I’m going to convince anyone at the Palace Casino to put on a magic show or build a magic show performance space addition. Not with one phone call or arm twist. I can’t make the kind of magic I want happen but that doesn’t mean it can’t be found. >> There’s no way I’m going to convince anyone at the Palace Casino to put on a magic show or build a magic show performance space addition. Not with that attitude you’re not! Winners never quit and quitters never get to see the one-eyed jack peepin’ through a hollow log! Live the magick! Battle back!